BelugaCDN Review 2019: Is BelugaCDN a Good Hosting? BelugaCDN is an American hosting company that has been providing outstanding and pocket-friendly website performance acceleration solutions to enterprises in the United States and beyond. BelugaCDN’s website is only available in English. The company primarily serves U.S. business websites, but also has a presence in several other countries, including Turkey, India, Brazil, and Argentina. Anyone in the United States looking for CDN solutions at pocket-friendly prices should look into the possibility of using BelugaCDN. Compared to a number of American companies that provide similar services, BelugaCDN is relatively cheaper and often preferred because of the quality of their service offerings. It is therefore not surprising that the company has managed to extend their presence outside the United States. While they’re relatively new to the scene with a founding year of 2015, BelugaCDN’s team has over 15 years of experience in the industry. It’s for this reason that they’ve invested heavily into setting up a fleet of sophisticated and cutting-edge servers utilizing ultra-fast SSDs. It’s important to note here that BelugaCDN focuses on performance acceleration, not website hosting: their goal is to complement your existing host and make your website load that much faster and more securely. BelugaCDN’s main selling point is that while their service works in the same manner as Amazon CloudFront and MaxCDN, it costs only a quarter of what you would pay for either of these two well-known vendors. Working with BelugaCDN can, therefore, save you an incredible amount of money. BelugaCDN does not replace your hosting vendor, but instead offers much-needed website acceleration solutions that any business wanting to stand out on the web should seriously consider. With no free trial or free version of this BelugaCDN solution, the only way to experience everything this vendor promises is to buy a subscription. Because BelugaCDN is not a web hosting vendor in a traditional sense, it does not have a 24/7 support team on standby. Instead, the company has simplified the setup process, making it possible to select, make payment, and launch your chosen service in just 45 seconds. That said, while the technical support team is not available around the clock, they’re still relatively responsive. BelugaCDN’s support team got back to me in less than 24 hours from the moment I sent them a message. 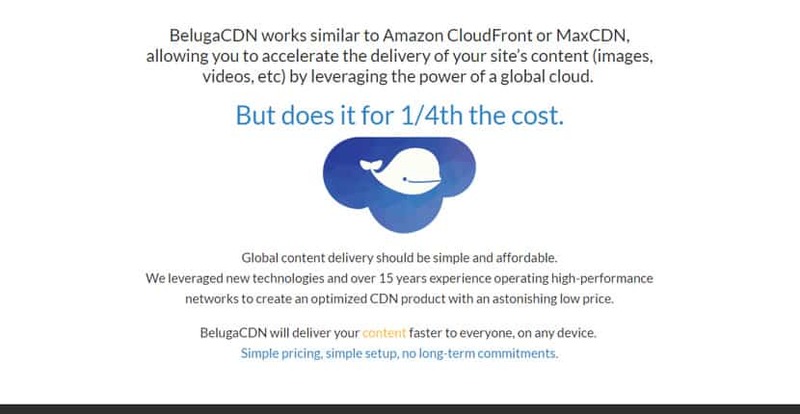 BelugaCDN uses a similar approach to MaxCDN or Amazon CloudFront, making it possible for businesses to accelerate their content delivery by leveraging the incredible power and capabilities of a global cloud. Wondering how BelugaCDN stacks up against other Web Hosting companies? Enter any other Web Hosting company and we will give you a side-by-side comparison.